After her father immigrated back to Laos five years ago, Mattie Do and her husband made the decision to join him in Vientiane. In doing so, Mattie and her husband became acquainted with Mr. Anousone Sirisackda of Lao Art Media, eventually developing their relationship to the point of creating a film together. After two years of production, Mattie and Lao Art Media are getting ready to release Lao’s first horror film, “Chanthaly,” in Spring 2013. “Chanthaly” will be Mattie’s first feature film. Currently Mattie, her husband, their two dogs and one cat reside permanently in Vientiane, Laos. 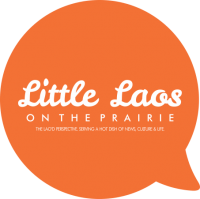 Little Laos on the Prairie had a chance to catch up with her for an interview. The natural question on everyone’s mind is: How did you get your start? Actually, “Chanthaly” is my start in filmmaking. I’ve never directed any short films or anything, and I never went to film school, although I worked for a film school a couple of years ago. But as a makeup artist. The great thing about being a makeup artist on small productions is that you actually get to send a lot of time close to the director, the actors and the camera. I was standing next to the monitor, staying on hand in case somebody needed touch-ups between takes. I really liked being on set, but I think I’m just about as surprised as anybody that I somehow ended up scrapping together a film of my own. When my husband and I decided to make a movie here in Laos, we figured that his language barrier would prohibit him from really being able to work with the actors, so he dumped this heavy film directing text book on me and told me I had a few months to figure it all out while we worked the script through the approval process with the Ministry of Information and Culture. When I was working at the film school, I was able to sit in on a bunch of acting classes, too. So I got in touch with the professors and they were really great about giving me advice. So I did have some great resources. I think I sort of anticipated that I could lean on my husband a little, but we ended up having such a small crew that I was kind of just left to it. We shot for a really long time compared to other Lao films. Almost 60 days of shooting over a six month period, so if something wasn’t working we’d take a day to think it over and then try it again in a different way. The film is 95 minutes long and I’ve got something like 50 hours of footage from my trial and error process of making my first movie. I think the whole time we were joking that if the film was just terrible, we’d throw the hard drives into the Mekong and never speak of it again. Was your family supportive of your interest to get involved in film-making? The crazy thing is, I’m not sure that my father entirely understands what I’ve been doing for the last year. I’ve explained to him that I’m making a movie, and he stopped by to watch us film a few times. He loves movies, and I just think that showing up at our house and watching us shoot with just a few lights and a Canon DSLR didn’t match his expectation of what making a movie should look like. And he knows about the festivals and the interest that we’ve been getting overseas, but I still think he figures I’ve been making a home video. I think at the end of the day, he’d support anything that keeps me here in Laos close to him. I have a really close relationship with my father, and that relationship really ended up being a big inspiration for the two main characters in the movie. “Chanthaly” is kind of a movie about a girl and her father at the end of it all. My mother passed away in 2005, but I think she would be really proud of the movie. I get a little teary when I draw connections between the film and my relationship with her, but when I was growing up, she really instilled in me this idea that I could do anything I wanted to do. I didn’t just have to be a girl or a wife. So all through my childhood, she really gave me a lot of opportunity to take on some pretty big responsibility. I think I ended up with a good sense of self confidence because my mother pushed me to work hard and excel. “Chanthaly” is breaking a lot of ground for Lao cinema. What’s something you’ve learned from the filming of “Chanthaly” that you hope to apply to future films you work on? I think the biggest lesson was, just because you can shoot an entire movie in your house while living there, it doesn’t mean you should. We ended up living surrounded by this giant pile of filmmaking gear for almost a year. It just never felt like we left work. I’d wake up in the middle of the night with the lights set up over my bed, stub my toes on the tripod while trying to get to the bathroom and think, ‘What am I doing?’ And then, even a small crew somehow generates a tremendous amount of dishes. So we’d wrap shooting at midnight and then my husband and I would have about two hours of housework to just make the house feel livable. Then it would start again in the morning. Other than that, it was all learning. My husband has a film background, but spent the last 10 years working as a screenwriter. So when we started “Chanthaly” we were something like, I don’t know, 80% sure we knew how to make a movie. “Chanthaly” was always supposed to be our training film. Get a bunch of people together, figure out who we could train and trust, make a whole bunch of mistakes and just enough profit at the Lao cinema to make a better second film which we would push out into the world. But in the end the movie is coming out really well. It’s been a happy surprise, believe me. I hope when we start filming my next movie in the spring, we’ll be able to start strong and work a little faster. It was all so theoretical before “Chanthaly,” but now I kind of feel like we’ve figured out how to make a movie. Your film has been receiving very positive word of mouth from those who’ve seen it. In what ways are you hoping to challenge audiences about their expectations of Lao culture and particularly Lao horror? This is all so cool, and so surprising for me. Our best hope for “Chanthaly” when we were making it was a Luang Prabang Film Festival premiere and a two week run in the cinema here in Vientiane. But now it’s bigger than that, and we’re kind of trying to figure out what that means exactly. I’m really excited that people like the movie though. About three months ago, my husband and I put together a rough edit of the film that ran about two and a half hours. I sat down and watched it with Nouth (who plays Chanthaly in the film) and it kind of dawned on us that it was actually a pretty cool story. It fit together, and I don’t know. I just really liked it, if that’s not a terrible thing for a director to say. It’s interesting that you ask about Lao horror and what the audiences might expect. Again, since we weren’t ever thinking about this film having much of a life outside of Laos, we tried–and I don’t know how successful we were at this–to really think about making a movie that would be scary for a Lao audience, understanding that a Lao audience has never seen a scary Lao movie. If that makes sense. And then we had to balance that with what we could actually do with our limited budget and resources, and with what a wary Department of Cinema would actually approve. So it’s not a blood and guts horror movie, and it’s not a monster movie. After I got my approval, I sat down and read the script again and I thought, ‘Wow, from a western horror standpoint, I don’t know if this is going to be scary.’ But then at the Luang Prabang Film Festival the audience was screaming and little kids were covering their eyes. So much of the film revolves around the ubiquitous spirit house and Lao superstition, and although the film gives a little bit of detail about that for an audience that might be unfamiliar with the ins and outs of Lao beliefs, there are a few things in the movie that are really terrifying to our Lao audience that might not even be unsettling for a foreign audience. What attracted you to the story of Chanthaly, and did the script change along the way? There were so many changes along the way. Two years ago, my husband and I sat down in the conference room at Lao Art Media and mapped out a story on the dry erase board. I’d thrown a lot of random ideas at him and he’d somehow made sense of it. Enough to get a basic outline together, and then we fleshed it out together. Once we had that outline, I took the idea to Lao Art Media and they gave me a solid rejection. Nobody thought the Ministry of Information and Culture would ever approve a horror film. So we brought the Department of Cinema in on the development process. We’d put a call in two or three times a week for about three months before we even started writing the script. Then it took another four or five months or writing, adapting the script back and forth between English and Lao, before we got the story to where it is now. But after that, getting our approval was really easy. The Department of Cinema is really great, they genuinely want to promote Lao filmmaking and they really gave us some amazing input along the way. I mentioned earlier about how I’m really close with my father, and so telling a story about a girl and her dad was always pretty personal. I based the idea for the story on a French ballet (if you can believe it!) and then I dumped a whole bunch of myself into that. So the film was always very personal. Like I mentioned earlier, it’s kind of a film about me and my father. What was your casting process like for “Chanthaly”? When did you realize you’d found your lead actress? I actually cast my lead actress a few months before I decided to make a horror film. In fact, she was part of the film before there was a film to be a part of. I was working on Lao Art Media’s ‘Lao Dream Star’ TV show, and Nouth was the presenter. We fought like crazy, and directing her on the TV show was so alternately frustrating and interesting, because she is such a crazy little thing. And she just looked great on camera. By the time we figured out how to work together, the TV show was over. Nouth was actually the reason we wrote a story so centered on the Chanthaly character, because I knew that she could carry the film. There’s so much of her in Chanthaly’s character, we really wrote the part for her and never considered anybody else for it. It was the same with the character of Chanthaly’s father, I cast Mr Soliphanh in the part, and then adapted the character around him. In the original outline for the story, the father only had one or two scenes, but Mr Soliphanh was so good that we just kept finding ways to add him into the story more and more. I really have to brag a little about my cast. For the most part, my supporting cast was also amazing. They each brought so much to the characters on top of what was in the script. That’s even more amazing considering that Lao doesn’t really have any professional actors. There are so few Lao movies, no Lao sitcoms or soap operas even. And our film shoot was pretty strenuous. Like I mentioned we shot 60 days over six months. So it was a lot of work. But they all really came through. So I really have to brag about my cast. I think that the best way to make a film in Laos, at least right now while we’re really just starting to develop a film industry, is to cast first and then write your script to fit the cast. I know that’s what I’ll be continuing to do in the future. Often, a film production can be an intense process, even from the beginning. How did you manage stress? Well, we worked slowly. There was always this idea that it was better to make a good movie than a fast movie. It took us eight months to write the script. And we organized the production around being able to have the space to make mistakes and the time to fix them. We shot the entire film in my house, so there was no rush to finish at the end of the day. If the sun went down, we’d start again when it came back up. That sort of thing. We kept the cast and crew small so that we wouldn’t have scheduling conflicts. We took long lunch and dinner breaks. It’s actually far more stressful now. The company that was supposed to help us through our post-production quit the film over personal differences and so my husband and I have been rushing to finish work that was supposed to have been finished months ago. So just like when my husband gave me that directing textbook and told me I better figure out how to direct a film, I had to tell him, ‘Look, I know that you don’t really speak or understand what my characters are saying in the movie, but you have to figure out how to edit my movie.’ And he has. Lao Art Media has been really great with me as well. They have really let me work on my own terms and set my own schedule. They have always stood behind me and defended my work. And now that we’ve sort of figured everything out, I think it’ll all go much more smoothly next time. Fingers crossed. What are you plans for “Chanthaly” in the near future, and will you be doing any follow-ups to this film? I just need to finish “Chanthaly.” It’s so close. I’ve said this before, but the attention that my movie has gotten is just amazing especially since we’ve only shown the film once, and since it was only a rough edit of the movie. I really have no idea what will happen in the future, but we’ll be showing the film in Vientiane next month at the Vientianale Film Festival and then we’ve received a couple of other exciting requests from other film festivals in North and South America. The film will hit the theaters here in Laos in March. We’re sticking to our original plan though. So the profit from “Chanthaly” in Laos is going directly into funding my next film which I hope to start filming in April or May. I’m submitting a couple of potential synopses to the Department of Cinema soon, so we’ll have to see what they think about the new ideas. They’re all quite different from “Chanthaly,” but they’re all still horror films based in Lao superstition and supernatural beliefs. Well, two of them are. The third is a zombie movie that my husband is really pushing for… but, it’s probably a little too much for Laos at the moment. But definitely another movie will start as this one wraps up. Editing has made me miss production, and it’ll be good to get the crew back together to film something else. Who do you look up to as cinematic role models? My cinematic role model would have to be, without a doubt, Darren Aronofsky. I was awestruck when I first watched “Pi” (so many years ago!). I still think back on it now, and loved it so much. It became one of those films I was afraid to go back to because I remember loving it so much in my youth. His other films were also all amazing, and as always, resonated to me – then there was “The Wrestler” and “Black Swan.” I’ve watched “Black Swan” so many times, I’ve lost count! The way those stories move, how the characters are able to express so much intensity with or without dialogue, the entire feeling of these two films – they just hit me to the core. Tears still spring to my eyes when Natalie Portman’s “Nina” finds out she’s been cast as The Swan, and I’m still breathless each time Aronofsky’s Wrestler takes flight against the blinding spotlights and screaming crowd. What would be your advice to emerging film-makers? Well, if they’re in Laos and thinking about making a movie, I think the best advice is to just get in touch with either myself or the guys out at Lao New Wave Cinema. There’s no better way to learn how to make a movie than by making a movie. There’s not so many Lao filmmakers here in Laos, and we’re all pretty friendly. And always willing to answer questions or give a little bit of help. I think that’s something really special about making movies in Laos at the moment. You get so much help from everybody working in the city. My husband and I helped ‘At the Horizon’ by doing the subtitles, and Anysay lent us lenses to help us shoot Chanthaly. In a few weeks, I’m actually acting in a short film for Lao New Wave. But we’re all on Facebook. We really just want to see more Lao movies get made, and we’re more than happy to talk about how to avoid the mistakes that we all made on our first films. If you’re a Lao filmmaker and living outside of the country, come back and make a movie. There’s a lot of opportunity for talented filmmakers to work hard and really be part of something unique and exciting. So much is evolving and changing here in Laos, and I really can’t wait for more filmmakers to experience it for themselves. In the meantime, I hope I can keep trying to bring Laos to cinema screens abroad! Next PostYear of the Black Water Snake, 2556: What will it mean for Lao America?